16" CPVC Butterfly Damper | U.S. Plastic Corp. These corrosion-proof 16" CPVC Butterfly Dampers are for the construction of exhaust ventilation systems. 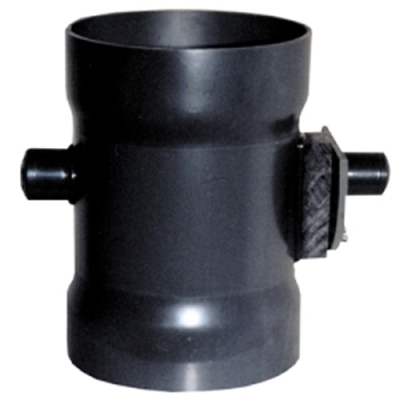 CPVC material compounds used in the manufacture of these duct fittings conform to Type VI, Grade 1 CPVC, Cell Class 23447 as described in ASTM D-1784. All internal parts are CPVC including the body, damper plate, and shaft. Locking hardware is stainless steel. Butterfly (balancing) dampers are furnished with a locking quadrant, to permanently position. Damper allows for less than 5% air flow restriction when open and offer an approximate 95% seal when closed. These dampers can be installed either vertically or horizontally. 16" damper is 15.75" long with a 2.5" socket depth and .187" thick damper plate. Maximum service temperature is 200°F. NOTES: Fittings are triple bead welded. Pictures are to represent style of fittings only; actual color is light gray.